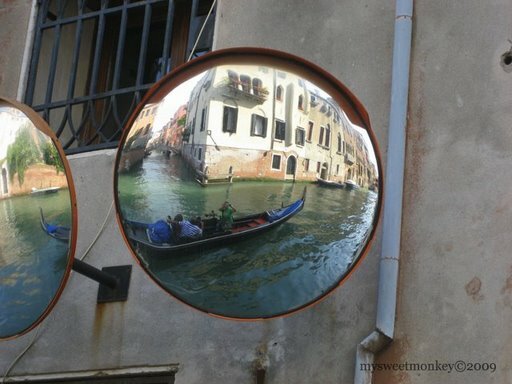 What can I say about Venice. This was my 3rd visit, mom’s 2nd & dad’s 1st. I felt like I knew the city but yet, made sure we had a map just in case we needed it. I really do love this city but, the over crowding of Tourist makes me really not want to go back. Yes.. I know I’m a tourist too but, after the 3rd visit, I feel like its my city. 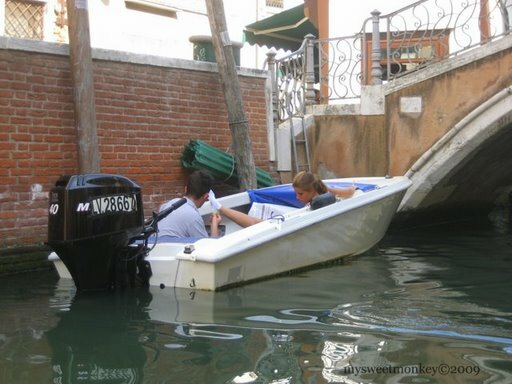 After all, I can get around pretty easily, I use the water buses & we even have a B&B that we stay at when we go. 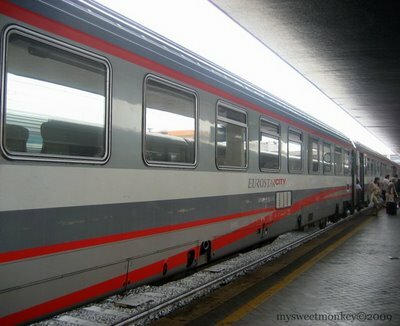 To get to Venezia from Torino is really easy! Taking the EurostarCity train, it’s less than 5 hours and you don’t have to change trains!! 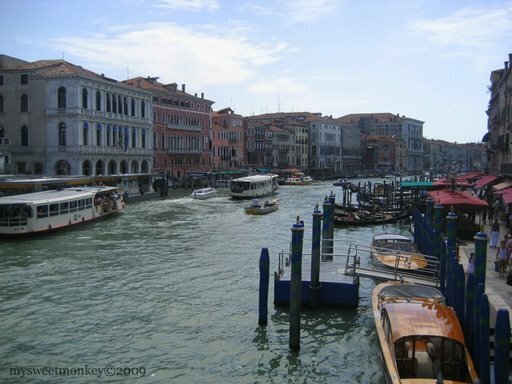 Navigating your way through Venice is easy… if you have a map! Luckily there’s a shop right next door to the train station where you can buy one. Don’t feel likeyou’reout of place if you’re walking around with your luggage…. EVERYONE DOES IT!! 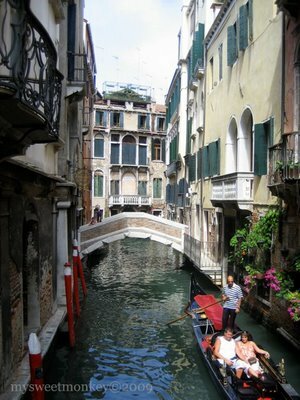 Making your way to your hotel or B&B is the best way to get a feel of Venice. It’s also the best time to start taking pictures. It’s easier to take pictures of the quaint streets as you’re going through them.. than to try to figure out where they are later. Also take the opportunity to take pictures when there are no other tourist around. 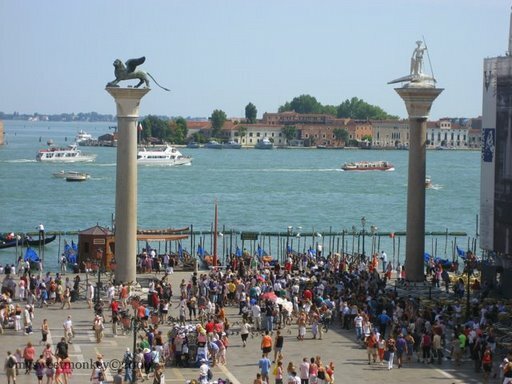 If you can actually find an area of Venice that isn’t busy with people.. then consider yourself lucky! Localsare used to people taking pictures of them doing everyday things. 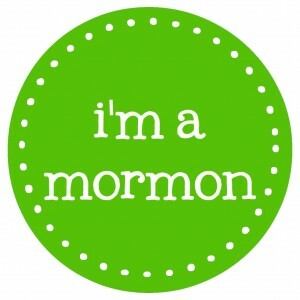 So, why not be apart of that! Once you’ve found your hotel/B&B and have rested for a while, GO OUT AND EXPLORE! 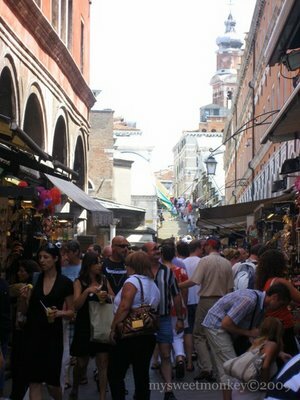 Make your way to the Rialto Bridge and start shopping! 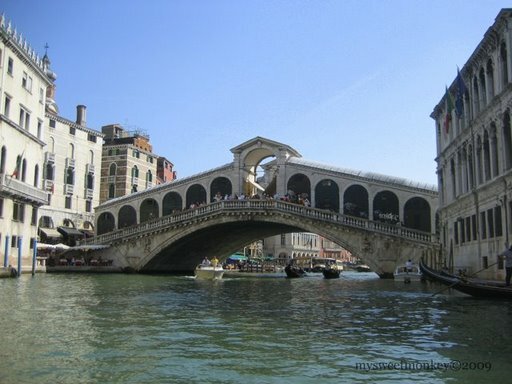 Don’t forget to stop on the bridge for a picture of the Grand Canal! You may have to push your way to the bridge but once you’re there.. it’s worth it! 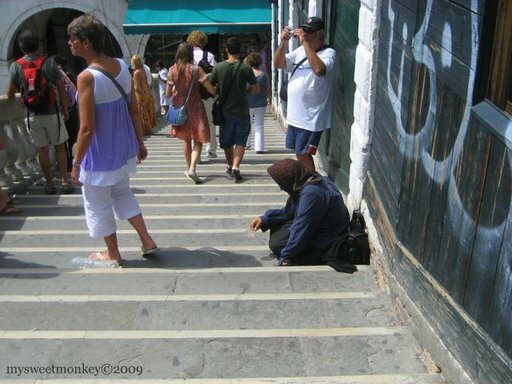 It can sometimes be hard to get a really good picture because there are so many people around…. 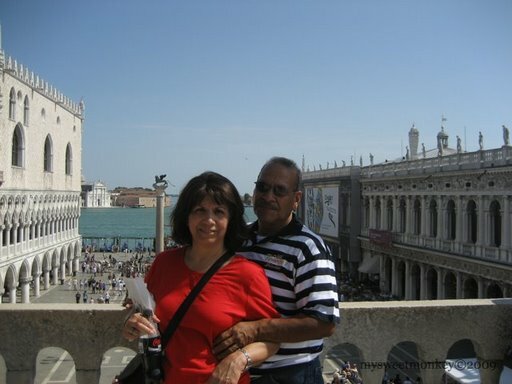 … but no matter where you go… you will always be able to capture a moment that is picture perfect! 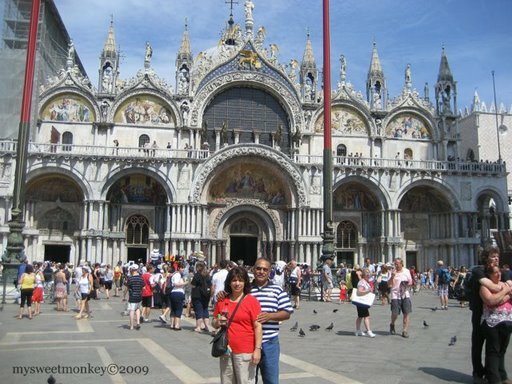 No trip to Venice is complete until you see the Basilica di San Marco. You know you’re close when you see everyone going the same direction. I hear the best time to see the Basilica is early in the morning or late at night. One day.. I’ll do that and let you know if it’s true. If you have the time, I suggest you take a peek into the Basilica. As well as paying the 4 euros to go upstairs and enjoy the view. 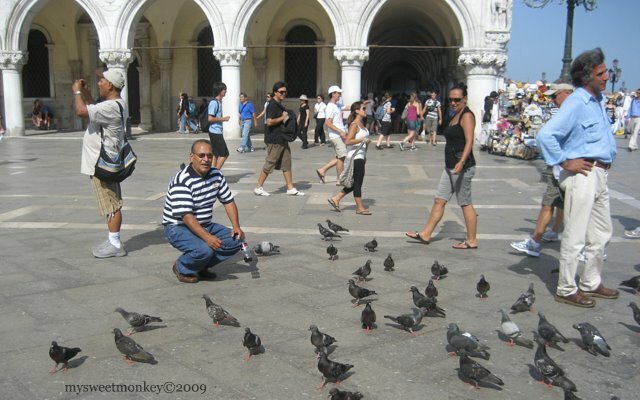 If you’re one of those people who wants to feed the pigeons then go ahead and buy a bag of food. They will literally flock to you as long as you have food to give them. 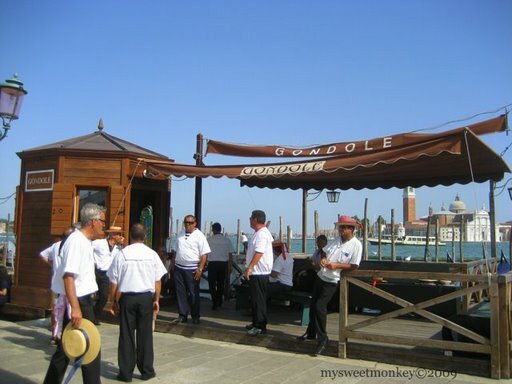 Personally, I think EVERYONE should take a Gondola ride through the canals of Venezia. Now, I’ve heard some people say it’s not worth it, that it costs too much, and that it’s overrated. I’ve done it twice… and I recommend doing it. Now, when it comes to cost, be smart! DON’T go on it if it’s over your budget. It’s not worth it if they are trying to charge you 200 euros for a 40 minute ride. Once you negotiate your price…. 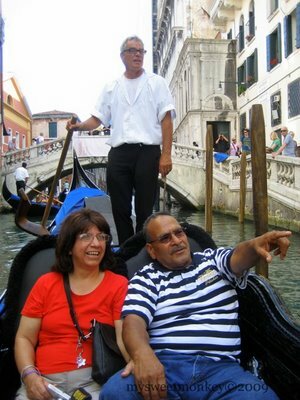 enjoy the ride…especially if you’re with the one person you love.. or in my case…. your family. 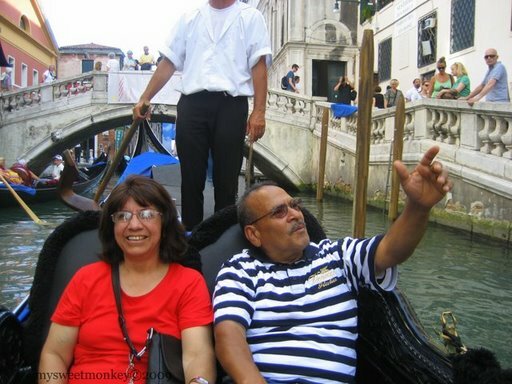 As many times as I have taken pictures of Venice’s canals, I’ve got random strangers in them on gondolas. If only they pretended they were in a Parade.. my pictures would be much more fun to look at! Why not pretend you’re the king and/or queen and you’re waving at your subjects! Don’t forget to take a picture of the one who’s taking pictures of you. That way they don’t feel left out but they can also prove they were there too! 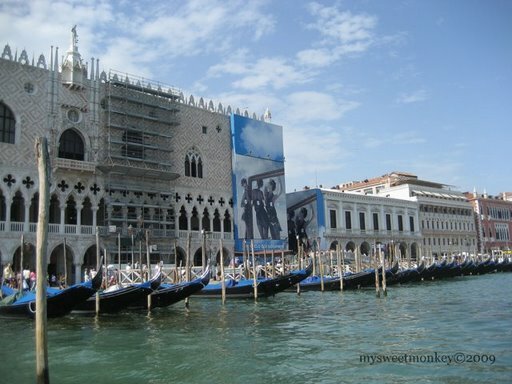 The only way to see the RialtoBridgeinit’s full glory is on a gondola…. don’t you think so? 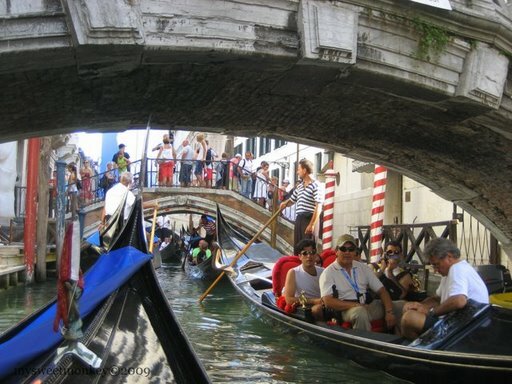 With so many tourist taking gondola rides, sometimes it feels like you are actually in rush hour traffic. Ifgondonlas aren’t your thing, why not buy a bus pass and take the Water bus to the other islands. You can gotoMurano and take a peek into the world of Glass blowing…. maybe even buy a beautiful chandelier and have it shipped home. 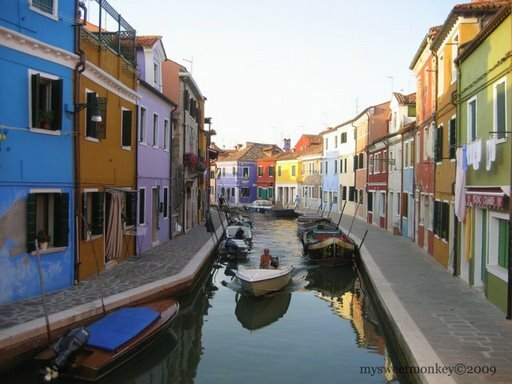 Maybe you wants something small and intimate…thenBurano is right up your alley. The second you step off of the boat you can feel the peace and tranquility this little island offers. Sure you’ll see tourist but, as the sun sets, they’re heading back to Venice and the locals are coming out take over their streets. Burano not only has great restaurants but is the place to buy Lace. 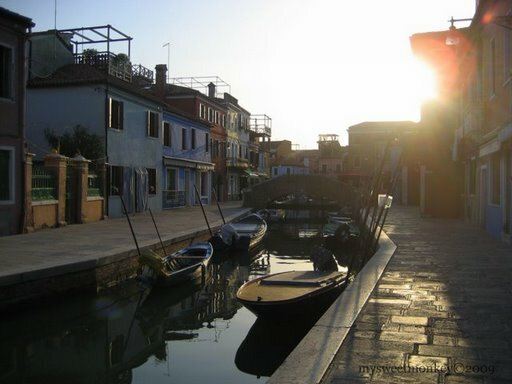 Lace making has been an important partofBurano’s history and it’s what makes this island so popular…. well, lace and the colorful houses. 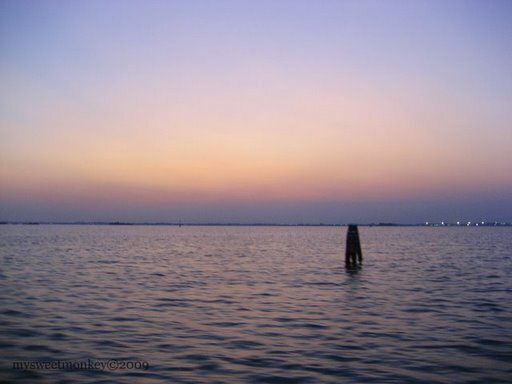 On your way back to Venice, make sure to catch the sunset. It’s breathtaking! 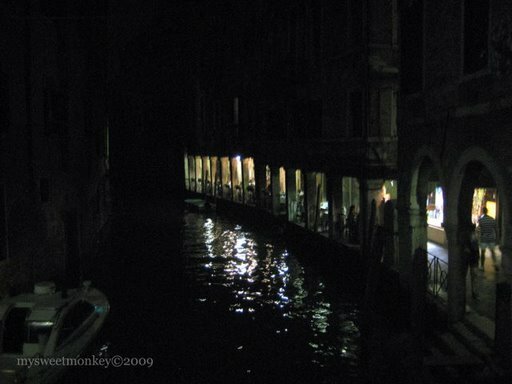 As I mentioned earlier, Venice at night is just as beautiful as it is in the day. Although if you don’t have the rightcameraequipement, there’s no point in trying to take pictures. 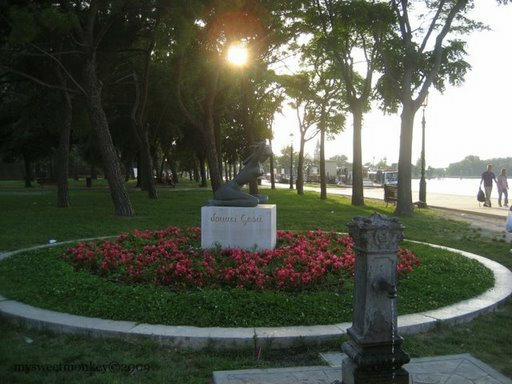 Just enjoy the evening, the atmosphere, and gelato before going to bed! 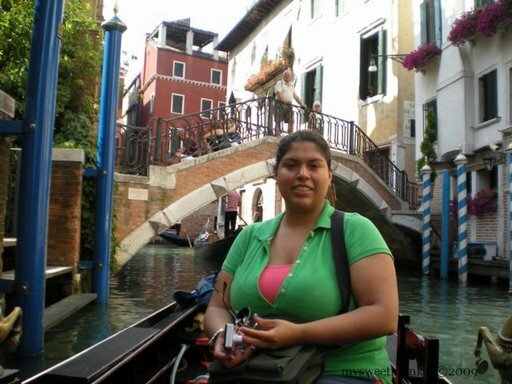 The more I see Venice, the more I want to go back and explore more. 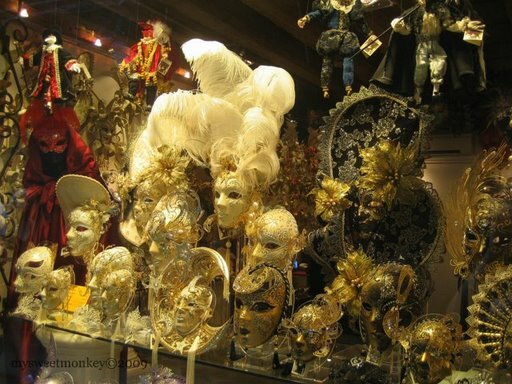 One day, I’d like to goduringCarnivale… I’ve already got my mask picked out! 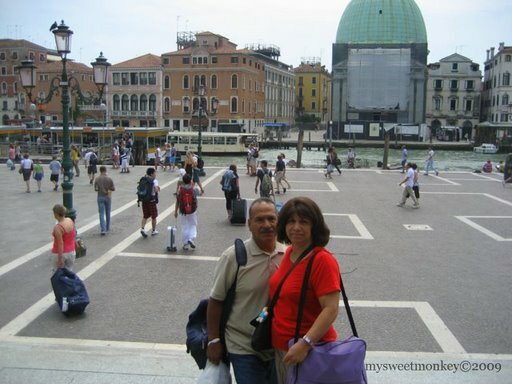 Oh, Venezia, is beautiful and so romantic. Sonia, you're so good at reading maps, I wouldn't mind getting lost during the day, because Everywhere you look is beautiful and picture perfect. I'm glad you were able to find our way back to the B & B that night. 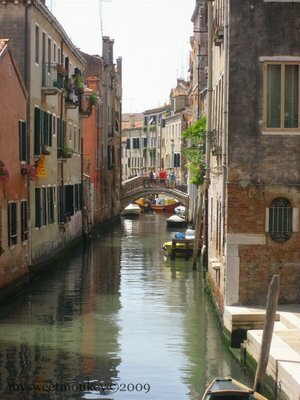 I love the shopping, the narrow streets or alleys, the canals and you don't have to worry about cars, cause there're not any there. 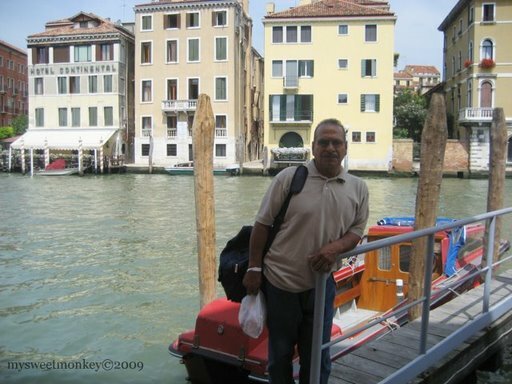 We would love to go there again! Bella Italia!